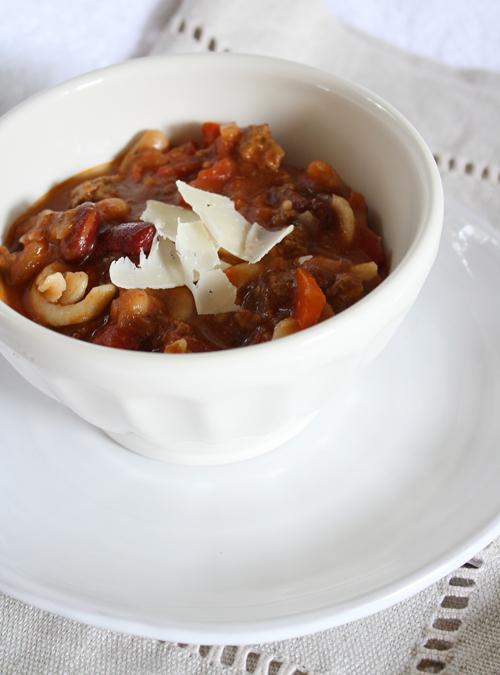 last week when it really started to feel like fall, i pulled out my slow cooker and had my eye out for a perfect recipe. after a bit of browsing, i decided to try out this one from a year of slow cooking. i liked that it was healthy and hearty, and employed the dump-and-go method that many slow cooker recipes do. served with honey wheat rolls and a green salad, and had enough to freeze for another dinner (and probably a lunch or two). here's to comfort food you can feel good about eating. chop up the carrots, onion, and celery, and add to slow cooker (six quarts or larger). drain and rinse the beans, and add pot. add the whole cans of tomatoes, and the pasta sauce. add the beef broth and stir well. add the salt, pepper, oregano, and tabasco sauce. spoon in ground beef, and stir to combine. cover and cook on low for 8 hours, or high for 4. when the vegetables are tender, stir in the uncooked pasta.